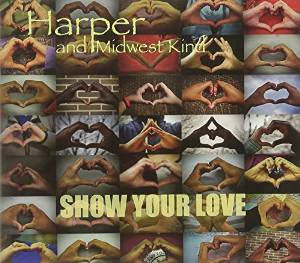 I just had the opportunity to review the newest release, Show Your Love, from Harper and Midwest Kind and it's quite different. Opening with Hell Yeah, a straight up rocker, harmonica, didgeridoo and djembe player and vocalist, Peter Harper is joined by Will Rideoutt on guitar, James Norris on bass and Carl Lewis on drums. A pop style track with indigenous roots, it's a clever opener. Bluesy rocker, What's Goin Down, features trademark harp playing by Harper as well as nice vocal harmonies and cool slide work Rideoutt. Title track, Show Your Love, opens with a march style drum beat evolving into a funky rocker with tight guitar riffs. Drive Brother Drive is particularly melodic with nice vocal blending, african style percussion and infused harp work. Bluesy, I Can't Stand This, is my choice of tracks on the release with it's "Philly" sound and soulful vocals. Al Hill adds solid electric keys to the track and Paul Randolph holds down the bottom on bass with Dane Clarke on drums. It's All In The Game has a real interesting bottom enhanced by Harper's work on the didgeridoo. Norris' bass work is a workhorse on this track and Lewis' drum work is tight. With a loose airiness to the track, Harper's vocals are solid and his harp lines float. Smooth and melodic, It's Time To Go, has a great formula for plenty of radio play with warm vocal harmonies. We Are In Control has a funky groove and hot drum riffs. Great vocal phrasing and nice harp lines carry this track. Let's Move is a cool motoring track with a dance feel. Short, concise lyric patterns and guitar riffs make this track hit. Hey What You Say has a modern beat under a classic R&B style track. Harper's vocals are pure and his harp playing well placed. Rideoutt's backing vocals are smooth and spot on. Wrapping the release is I Look At Life, an easy paced rock ballad with an almost Joe Walsh style melody. I really like the vocal harmonies on this track and Rideoutt's guitar work balanced with Harper's harp work gives the track just the right touch to make this a choice closer. Very nice.